Republican leaders in the Iowa legislature say they will meet with Governor Kim Reynolds to chart the state’s response to the catastrophic flooding that’s hit western Iowa, but House Speaker Linda Upmeyer of Clear Lake said she’s worried more flooding is on the way. The Federal Emergency Management Agency requires states and local governments to come up with “matching funds” when federal aide is distributed in disaster areas. After the massive flooding that struck Iowa in 2008, state officials dipped into the state’s economic emergency fund to pay for some of the response. Upmeyer said legislators will first look for ways to find extra money within existing budget plans to respond to this year’s flooding, but that emergency fund is an option. 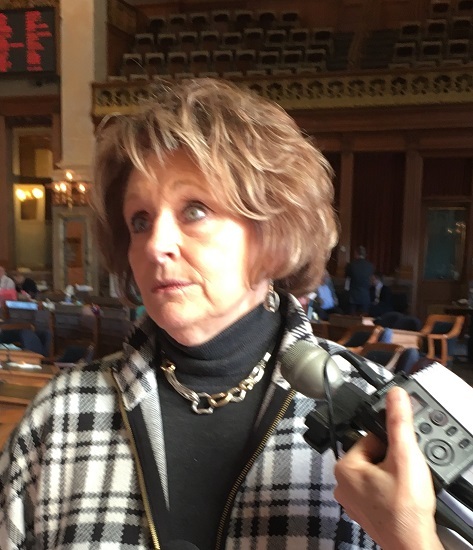 Senate Majority Leader Jack Whitver, a Republican from Ankeny, said the governor has seen the flood damage firsthand and she’ll take the lead in determining the extent of the state’s response. “It is a tough situation and a dire situation in southwest Iowa and we’re getting constant feedback from our senators that represent that area,” Whitver told reporters Thursday. In 2009, Democrats who held majority control established new committees in both the House and Senate to address flood-related issues. Senator Rob Hogg, a Democrat from Cedar Rapids, was chairman of the Senate’s Rebuild Iowa Committee. Hogg said as chairman of the Rebuild Iowa Committee in 2010, he asked Kim Reynolds — who was a freshman state senator at the time — to manage a bill about disaster case management. Upmeyer — who was a member of the Iowa House after the floods of 2008 — cited creation of the Iowa Flood Center as one of the accomplishments of that time period. “That still exists, so we have resources already in place that we can go to,” Upmeyer said. The center has developed flood-risk maps and has a website with a variety of flood-related data, including some flood depth analysis.